View More In Helmet Accessories - Page 3. Easy to ApplyIf you're facing fogging problem on your motorcycle visor, Here is a perfect product to help you out. This is a universal anti-fog visor insert. It can solve your helmet visor's foggy problem permanently. And it can be installed on the inside of a motorcycle visor easily. Most helmet visors have poor or even no anti-fog coating,then your visors will be fogging easily. Some visors have pinlock system, but they're too expansive and only fit for specific models. So, most riders are suffering poor visibility in cold or humid weather. That's so dangerous and uncomfortable. Here are the installation steps. 1) Wash your hands. Find a clean table. 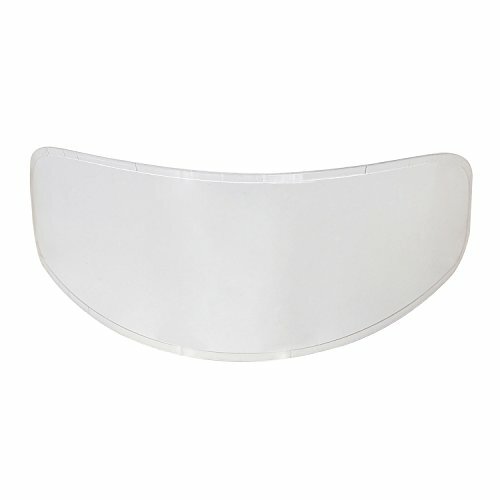 2)Open the packaging of WeePro anti-fog visor insert. You will get one insert, one piece soft fabric, instruction carton paper. 3)Clean up your helmet visor with the soft fabric. 4)Remove the Positioning Mask with a red tag. 5) Install the positioning mask on the outside of your visor. You can adjust the position freely until it is on a comfortable position. The cross should be in the middle of visor. 6)Press the insert with your two hands to fit the visor. Match the insert's middle cross with the cross on the positioning mask. 7)Use one hand to fix the insert. Use another hand's finger with fabric to press around to seal the visor insert neatly. 8) Tear off the mask with the blue tag. 9)Tear off the outside positioning mask with the red tag. If you have any questions about this product by WeePro, contact us by completing and submitting the form below. If you are looking for a specif part number, please include it with your message.